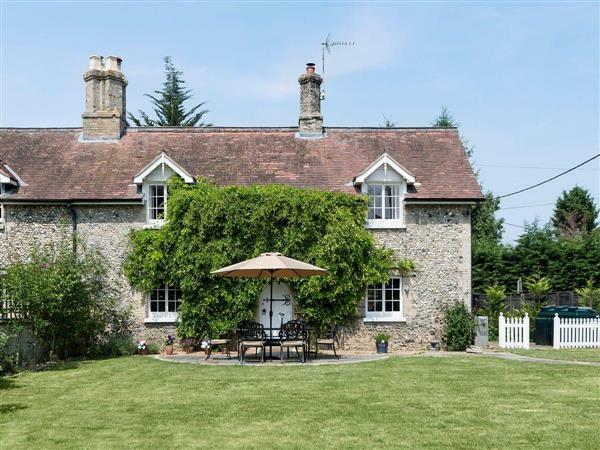 Bridge House in Ickburgh, near Brandon, Norfolk sleeps 6 people. Bridge House near Brandon was a 13th-century chapel; Bridge House later became a bridge toll house in the 16th century. It still retains some exterior 13th-century door frames, with an intricate carving that history buffs will love. Those expecting all the up to date amenities needed for a great holiday will love Bridge House too. The owners have lovingly decorated and furnished it to provide excellent accommodation for discerning guests looking to have somewhere special to return to after a day’s sightseeing. Enjoying a great position on the banks of the River Wissey, Bridge House has a spacious enclosed garden, leading to the river itself. It has two wood burners, one to relax in front of in the stylish living room and another to eat in front of in the dining room. It also has three bedrooms, two bathrooms and a small but perfectly formed kitchen, which benefits from an external utility room with full laundry facilities. But it’s not just these things which make Bridge House a great choice it’s the look and feel of it. It is easy to tell that this is a much loved family holiday home, belonging to an owner with a real eye for interiors. Bridge House is ideally situated for exploring the many delights of Norfolk, Suffolk and even Cambridgeshire. It is perfect for bird watchers, who can start in the garden itself, and great for walkers and cyclists, with so much to do on your days out. Close by lies Thetford Forest with High Lodge and Go Ape. City lovers can explore the medieval city of Norwich with its imposing Norman Castle, the Hanseatic Quarter of old Kings Lynn, Ely with its magnificent cathedral, the university city of Cambridge, and Bury St Edmunds with its famous Abbey. Coast lovers can be at the gateway to the spectacular north Norfolk coast in less than an hour. With so much to explore in every direction, you will be spoilt for choice what to do, before returning to Bridge House for a relaxing evening and a good night’s sleep. The shop, pub and restaurant are all 1½ miles from Bridge House near Brandon. Bridge House near Brandon has a step to the entrance. Living room: With wood burner, 42 Freeview TV with Netflix and DVD player. Kitchen/dining room: With wood burner, double electric oven, electric hob, microwave, fridge/freezer, dishwasher, 42 Freeview TV and wooden floor. Oil central heating, electric radiator (ground floor shower room), electricity, bed linen, towels and Wi-Fi included. Initial fuel for wood burners included. Highchair. Welcome pack. External utility room with washing machine and tumble dryer. Enclosed lawned garden with patio, garden furniture and barbecue. Private parking for 3 cars. No smoking. Please note: There are some low ceilings and doorways, and an unfenced river at the bottom of the garden, 100 yards away. Holidays at Bridge House run from Friday to Friday. For a better idea of where Bridge House is, you can see Bridge House on the map below. Bridge House is in Norfolk; should you be on the lookout for a special offer, you can find all the special offers in Norfolk. It's always worth checking to see what is on offer at the moment. Do you want to holiday near Bridge House (UKC1956), you can see other cottages within 25 miles of Bridge House; have a look to find your perfect holiday location.